We hosted the first meeting of the policy-level CASA Steering Committee here at the Bay Area Metro Center. While mostly an introductory session, I was pleased with the significant turnout of members, including dual MTC/ABAG board members Cortese, Mackenzie, and Pierce, MTC Commissioner Schaaf, and ABAG Board Member Julie Combs. The next regularly scheduled meeting of the committee will be in January 2018. A statewide poll has found that 54% of California voters would vote against a possible ballot measure to repeal the taxes and fees contained in the Senate Bill 1 transportation funding package approved by the Legislature earlier this year. The cross-tabs reveal that the level of opposition among regions of the state is highest in the Bay Area at 60%. The Bay Area Infrastructure Financing Authority (BAIFA) is now the proud parent of its first baby express lanes on Interstate 680 between Walnut Creek and San Ramon in Contra Costa County. In the first few weeks, business has been modest but we expect usage to pick up over time. BAIFA’s next project is on I-880 in Alameda County. Congratulations to Andy Fremier, Lisa Klein, and the whole BAIFA team on this major accomplishment. Kudos to the San Francisco Estuary Program for another stellar conference that drew hundreds of participants to the Scottish Rite Temple in Oakland. I attended a provocative panel discussion involving Resources Agency Secretary John Laird, Assemblyman Rob Bonta of Alameda, and ABAG Board Member Dave Pine. I briefed the executive committee of the East Bay Development Alliance on the MTC/ABAG staff consolidation. A copy of my PowerPoint presentation can be found here. I briefed this forum of local planning directors on the MTC/ABAG staff consolidation as well. Our hearts go out to families of the residents killed and also those displaced by the rapidly moving wildfires that burned all last week, especially in the City of Santa Rosa and the unincorporated areas of Solano, Sonoma and Napa counties. On October 17, I sent a letter to all the local elected officials and city managers of the three counties offering the assistance of both ABAG and MTC staff as they transition from disaster response to long-term recovery efforts. ABAG’s resilience program staff quickly posted a web page of useful resource material that can be found at the following link: resilience.abag.ca.gov/uncategorized/north-bay-fire-resources. MTC’s 511 program also came in handy by alerting North Bay residents of the various road closures that were necessary last week to enable the firefighters to do their dangerous work. I moderated a panel at this annual event that is sort of like the Davos conference for southern California transportation and land use professionals. MTC commissioners and staff have joined the event for many years to learn from our Southland peers and also to razz them about the Los Angeles Dodgers. My brief remarks as moderator can be found here. The latest meeting of the multi-agency Bay Area Partnership was focused on two programs that will see dramatically augmented funding levels from the passage of SB 1: the State Transportation Improvement Program (STIP) and the State Transit Assistance (STA) program. You have a committee recommendation before you today on our proposal to link STIP funding to housing production. The STA policy issues will be arriving at your doorstep by the end of the calendar year. At the MTC Planning Committee last month, we presented the latest update on traffic congestion and other indicators of regional health from our Vital Signs project. There was quite a bit of consternation among commissioners that the average amount of traffic congestion experienced by Bay Area commuters seemed so small. As I remarked at the meeting, that’s the problem with averages: when Bill Gates walks into a bar, everyone in the joint, on average, becomes a millionaire. I asked MTC planner Dave Vautin to take another pass at the subject of commute times. These data show that “extreme commutes” – greater than 60 minutes in length – have grown rapidly in the last decade. Now that’s more like it! On Monday, October 9th, the Bay Area experienced a 4.1 earthquake about 12 miles east of San Jose near the Calaveras Fault. The small jolt-and-roll caused no damage but served as a not-so-gentle reminder that the Bay Area rests upon a number of restless faults. 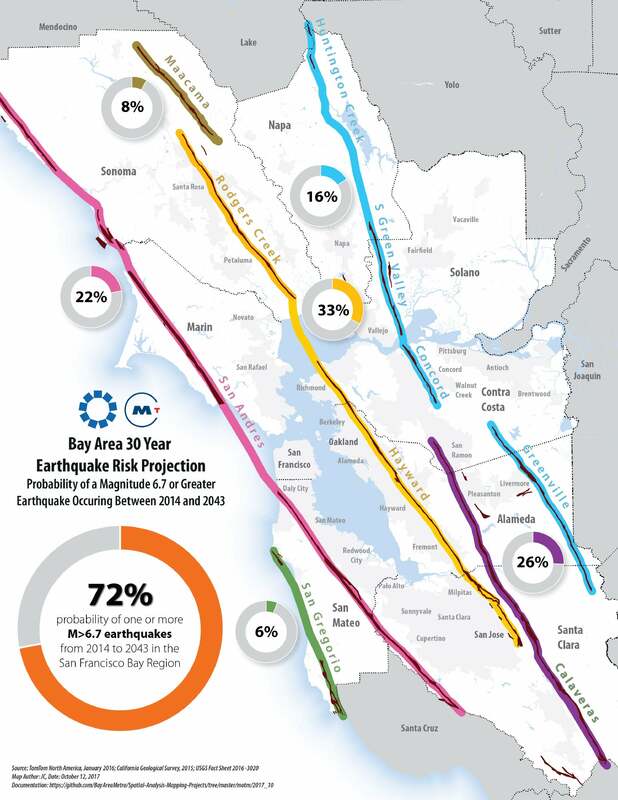 According to the United States Geological Survey (USGS), as depicted in this map, there is a 72% likelihood that the Bay Area will experience a magnitude 6.7 or greater earthquake over the next 30 years. For context, the 1989 Loma Prieta earthquake, with a magnitude of 6.9, was responsible for 63 deaths and severely damaged elevated transportation infrastructure in San Francisco and Oakland. The fault with the greatest likelihood of earthquake is the Hayward-Rodgers Creek Fault, which runs roughly from East San Jose in Santa Clara County to Santa Rosa in Sonoma County. When considering earthquakes, it is important to remember that the magnitude scale is logarithmic, meaning a 7.0 earthquake would release 33 times more energy than that of the 6.0 South Napa Earthquake which occurred in 2014. Each month MTC’s Executive Director provides a report to update the Commission and the ABAG Executive Board. These reports typically include a summary of events, a chart or map of the month and Operational Statistics, a monthly report card on the performance of programs such as 511 and the Freeway Service Patrol.